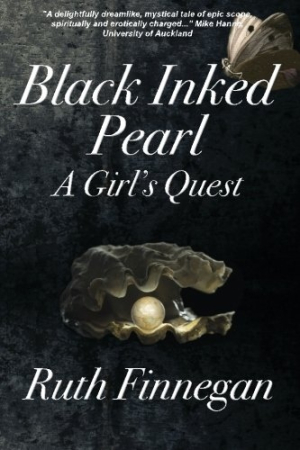 Fans of classical verse and fiction will appreciate the rich allusions, universal themes, and linguistic creativity of Black Inked Pearl. If James Joyce’s dream-like opuses were written from a more feminist perspective, they might look something like Ruth Finnegan’s Black Inked Pearl, a rapturous fantasia of words and images set somewhere between ancient myth and the green shores of modern Ireland. Two epigraphs explain the title. “Black Ink,” taken from one of Shakespeare’s sonnets, refers to the act of writing itself, of using the pen to stave off mortality and preserve beauty. “Pearl,” taken from a maxim by the thirteenth century Persian poet Rumi, is represented in the poetic sense as a kernel of wisdom, a spiritual treasure to be sought. In this way, Black Inked Pearl is a traditional quest story, though its diction is decidedly nontraditional. The book’s heroine, Kate, finds herself searching for divinity in “the wilderness of love.” She becomes a central character in a reimagining of the Garden of Eden and other biblical and classic narratives. In other places, however, the prose is too hackneyed to sustain the book’s symphonic aspirations: “black was the sky, black the sea, the rocks. Black her heart.” More overwrought constructions, such as “nothingness of nothinged voidedness,” become numbing after a while. If there’s a line between playful language and plodding language, Black Inked Pearl crosses over into plodding territory more than once. The book’s best moments stay on the playful side of language. This is particularly true of the narrator’s sly, subversive treatment of patriarchal power structures. In a passage relating the protagonist’s religious instruction, for example, the proverbial fall of man is specified as “Male pride that riseth erect in the passion of night, falls to nothing under the star, the lull, the fall of morn.” Unlike Joyce’s heroes, Kate must find self-expression and self-fulfillment among traditions and institutions that historically exclude women. Hers is a fight for equality in the eyes of God. It’s a fight worth following. Fans of classical verse and fiction will appreciate the rich allusions, universal themes, and linguistic creativity of Black Inked Pearl. Even those who prefer simpler language and more traditional plotlines might find passages worth noting and taking to heart. Finnegan is a talent to watch.